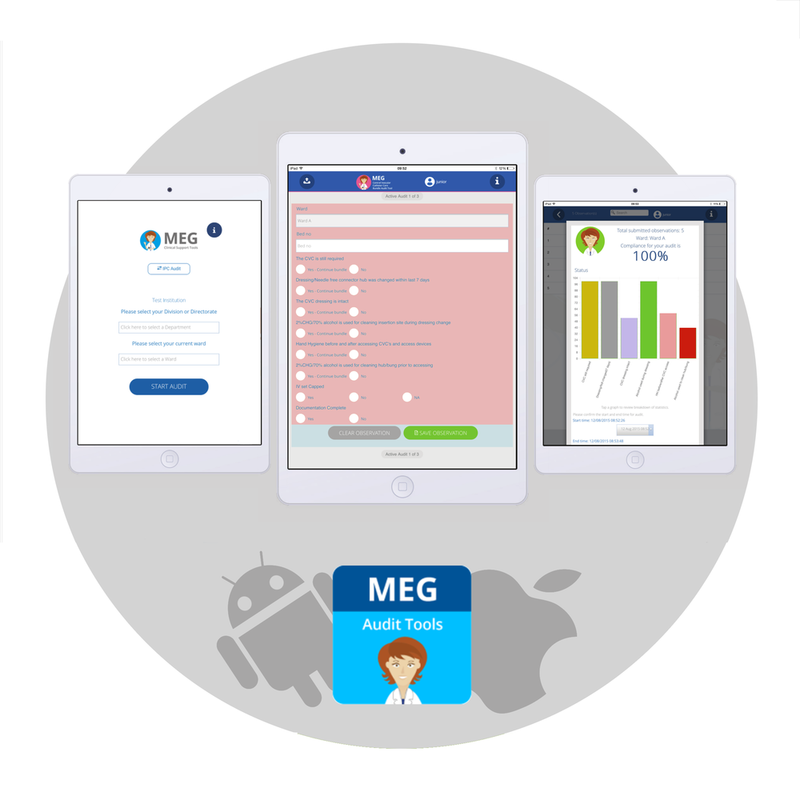 MEG's Auditing tools are a suite of hygiene auditing applications that can help reduce healthcare associated infections (HAI) through audit, feedback and reporting. We provide auditing tools on mobile and tablet devices which generate instant results and reports for IPC auditors and managers. Our software also includes training information and WHO hygiene guidelines for auditors to train staff at the point of care. Audits become are more accurate and auditors save time, allowing IPC teams to spend more time with patients and attending to other clinical and research components within the IPCN role. MEG has developed a wide range of auditing tools to be used across a range of different disciplines in hospitals. But we also understand the more custom built the audit is to your hospital, the deeper the understanding of your data. With our new 'Build your own Audits' we can build a custom set of questions that align with your hospitals reporting requirements. We work closely with clients to make sure they get the exact forms they're looking for. So if you can't find the perfect audit for your hospital's requirements, contact us below. Our Hand Hygiene audit tool provides a user friendly solution to manual, paper based auditing. Observations are collected easily and our software generates instant reports with visual graphs and charts. Quicker, more accurate audits are made possible by eliminating the step of transcribing paper to digital, with all the recorded audits feeding directly into a secure cloud storage system. Compliant with the Care Quality Commission (CQC) audits, epic3 guidelines and Health Protection Scotland (HPS). Our Environmental auditing tool is based on the Infection Prevention Society (IPS) and Health Information and Quality Authority (HIQA) standards for environmental auditing. Measure baseline environmental hygiene compliance with standards and identify areas for improvement by creating a Quality Improvement Plan. This solution includes camera intergration which allows auditors to take and add photos to reports and plans. MEG has developed clinical support tools for Peripheral Vascular Catheter, Central Vascular Catheter and Urinary Catheter maintenance care bundles. Our CVC and PVC care bundle maintenance tools (the elements) are based on 2014 update of the 2009 National Guidelines for the Prevention of Intravascular Catheter-related Infection in Ireland. These bundles have been adapted with permission from the CVC/ PVC care bundles produced by Health Protection Scotland in 2008 and published as part of the 2009 National Guidelines for the Prevention of Intravascular Catheter-related Infection in Ireland (source:HPSC). Our UCC tool has been sourced from HPSC, which adapted it from the CAUTI bundle produced by Heatlh Protection Scotland. Instantly understand and benchmark your organisations auditing data 24 hours a day. Get comprehensive real time reports; heatmaps, charts and graphs that are accessible via our reporting dashboard. Sort your data via ward or divisions, by health-care profession, for specific time frames or according to hand hygiene moments. The ability to address infection outbreaks immediately, enables teams to improve patient outcomes and allowing more time to focus on productive patient care.